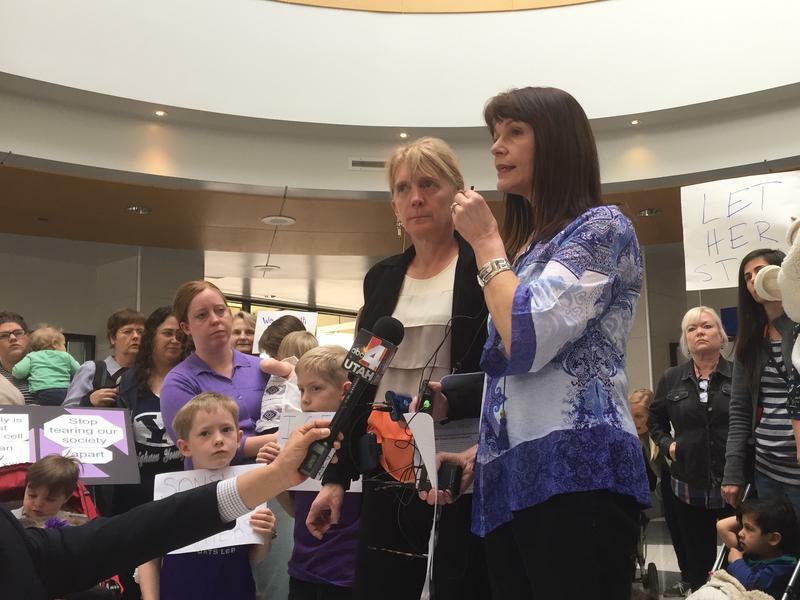 Judi Hilman of the group Salt Lake Indivisible and Sharlee Mullins Glenn of Mormon Women for Ethical Government spoke on Thursday about the pending deportation of Teresa Ramos. Around 60 women and children stood in the international arrivals terminal at the airport for what they described as “in prayer to protest” while Immigration and Customs Enforcement officials were in the process of deporting Teresa Ramos. Sharlee Mullins Glenn is with Mormon Women for Ethical Government. She says Ramos is an LDS woman originally from Columbia. According to Glenn, Ramos had overstayed her visa since 1997 but each year had applied for a “stay of removal” which allowed her to stay in the U.S. to care for her son who is a citizen and who has mild cerebral palsy and epilepsy. "Every single year she has received an extension because of her extenuating circumstances. She’s a single mother of a disabled son. And also, we found out yesterday, is caring for her 86-year-old mother," Glenn said. Luis Garza is Executive Director of the Latino advocacy organization Comunidades Unidas. He says this case, and similar ones of three other Utah families, shows how the priorities of ICE have changed in recent months. "Instead of focusing on people that have criminal background, instead of focusing on that criminal element, the administration has chosen to focus on people that have been here for 20-something years," Garza said. According to Carl Rusnok, a spokesperson for Immigration and Customs Enforcement, there have been no changes to immigration law or policies when it comes to removal orders. Officials from The Church of Jesus Christ of Latter-day Saints declined to comment on Ramos’ removal. As of Thursday afternoon, Sharlee Mullins Glenn said that Ramos was still at the airport because of the possibility of restarting a past citizenship application and support from the Columbian consulate.